Bright realistic landscapes originated from the imagination of this great classic painter. 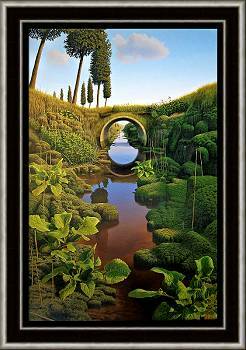 Extraordinarily fascinating paintings of detailed colorful landscapes that seem to exist, however are meticulously compiled by the painter. Hans Parlevliet (1953) paints detailed and realistic. His paintings are coloristic, without losing picturesque. Much attention is paid to the composition, which is weighed very carefully. The northern Dutch landscape plays a key role in the work of Hans Parlevliet. A tight horizon, often visible from left to right, an alternation of pastures, whether or not bald fiels, water and here and there a tree, is the scenario with which he builds up his paintings.The themes he uses change very slowly, as if in slow motion comic. 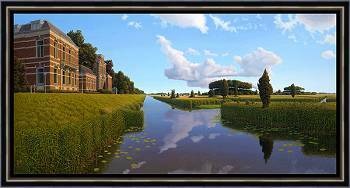 Although the landscape elements that Hans Parlevliet uses are very recognizable, the landscapes are basically non-existent. They are fabricated, taken out of context, moved or enlarged. Typical of many of his paintings is the light that almost always comes from the side, with often an alienating aspect. Much work is devoted to the foreground, that often begins right at the feet of the spectator. Sometimes he places a little picture joke, for perspective, but also to reward the attentive viewer. Hans Parlevliet studied at the Minerva Academy in Groningen, The Netherlands.